Actress Hina Khan, who stars in daily soap and movies, is known for her perfect sartorial choices. From western wear to ethnic wear, she can carry any outfit with utmost grace and elegance. Now, she is all geared up to feature on the cover of a wedding magazine and it proves that what a perfect bride she would make. Earlier today, January 27, she took to Instagram to share a Behind-the-scenes from her photoshoot for the magazine. 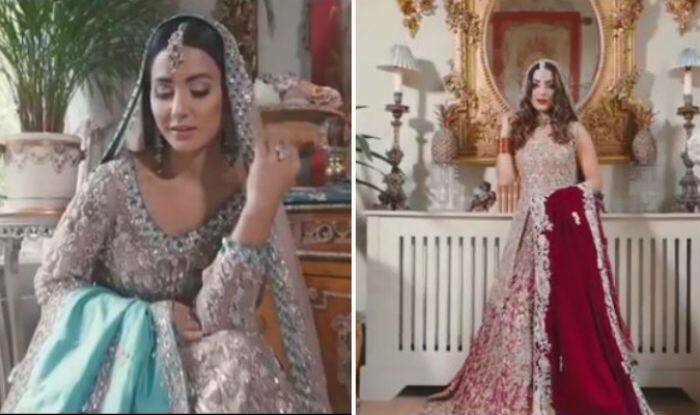 In the video, she wears different and most beautiful wedding dresses teamed up with statement jewellery and subtle makeup. She looks gorgeous in all the outfit, as always. A few days back, she has met superstar Aamir Khan and became the part of a special show which will be aired on January 26. Dressed in white floral attire, the lady looked amazing. With minimal makeup, she kept her hair open. It is quite evident from the pictures that Hina is Aamir’s ardent fan. Hina took to the social networking site Instagram to share the pictures. She captioned it as, “Life may appear to us as if it’s a mere journey from point A to point B. In this journey sometimes we face unrelenting hurdles, heart sinking tragedies and the very common human urge to avenge their loss.